RUSH: Did you see nine Democrat senators are demanding that Trump resign? Bob Casey, Pennsylvania, the latest to join the fray. It’s clear now what the Democrat strategy with Trump is gonna be. It’s just a continuation of illegitimate, unjust, has no business being there, cheater, liar, all that sort of stuff, womanizer. And I’m interested to see how this goes over with these senators’ constituents. This guy claims to be flabbergasted over the fact the Democrats have stopped having any interest in helping people and that their only focus is getting rid of Donald Trump. I’ll have the details as the program unfolds. 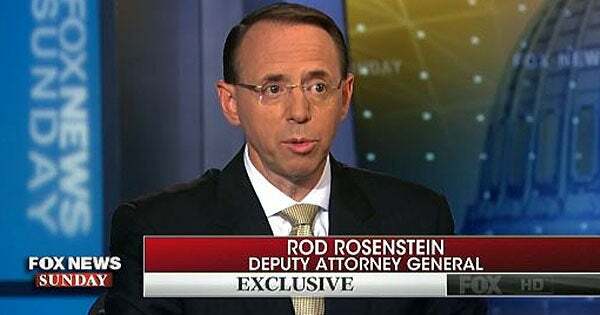 RUSH: The Daily Caller has a story today: “Democrats Mobilize Against Rod Rosenstein As Inspector General Investigation Zeroes In On FBI.” We told you about this yesterday. I raised a very important question and answered it for you. How do we know about these texts between FBI agents? We’ve got the texts between Strzok and his mistress, Lisa Page. There are 10,000 of ’em. And when they started leaking, a lot of people said, “Who’s doing this? How do we know? Does the FBI actually ride herd on everybody? Is there somebody in there that’s reading every text message and every communication?” We came to find out that there is a massive inspector general report of the FBI and the DOJ taking place, and it’s been going on for many, many months. And then we came to learn that Devin Nunes, who runs the House Intelligence Committee, has been demanding some information from this investigation because members of the FBI are stonewalling. They’re refusing to come up and answer questions. So after these various agents and other actors are refusing to show up at congressional hearings, the leaks started. So the inspectors general office is deciding to leak — this is kind of unheard of, I mean, leaking is not unheard of, but for inspectors general. Now, theoretically they are independent. They’re there to inspect and examine, every cabinet level department has one, inspector general, he has an office, has a bunch of people, and their purpose is to keep the agencies clean and to ferret out corruption, wrongdoing, or whatever within the agency. And they’re constantly working, and sometimes they’re given specific charges. Well, this IG is looking into what the hell’s been going on at the FBI in regards to the Strzok relationship with the babe and then the relationship the FBI has to Fusion GPS and the Trump dossier and all that. And now these texts between Strzok and Lisa Page are leaking, and it appears they’re coming from the inspectors general office. Now, people are surmising that if the IG is leaking this stuff now, what he’s got left must be bombshell. There’s a theory that these leaks are happening to prepare us, the American people, for a bombshell report so that when it comes we’re sort of conditioned for it and not hit over the head with it. But the Democrats are fit to be tied over Rosenstein. Rosenstein bowed to the pressure they brought to name a special counsel, which Comey engineered, by the way. And they’re upset because the Department of Justice inspector general released text messages from Strzok “on both the Clinton email investigation and the Russia probe rooting for Clinton while he was investigating her and discussing an unknown ‘insurance policy’ against Trump in case he won the election. I think it was Congress that was demanding the release of these texts, Congressman Raskin. I think one of the reasons these texts are being released is that Congress has demanded these agents come up and testify and they’re being told no, they’re stonewalling. The DOJ has been sitting on all this for more than five months after Devin Nunes and his team have been requesting it. Right. Opinions from people who are using the FBI and the FISA court to get dirt on political opponents. So I thought yesterday that’s what this — but the fact these clowns are mad at Rosenstein, you got to love that. They should be in love with Rosenstein! You know what we need, folks? We need some intelligence community neutrality. Establishment Washington is dominated by leftists. Establishment Washington has established a surveillance state of its political opponents, i.e., Republicans and conservatives. Domestic communications are swept up, political operatives have ready access, which allows ’em to do with them as they please, i.e., insurance policies. We know this because Donald Trump was elected president. We know that the intelligence community and the deep state has been working with the Clinton campaign, the FBI, to undermine Trump. We need to reverse the concentration of power and information, and for that I’m calling intelligence community neutrality right now.